Today’s Frugal Photo Friday challenge is to post pictures of Home and Decor. I am not much of a decorator but I am a renovator. My husband and I spent 5 years renovating three homes two of them we purchased for under $15,000. The name for this blog grew out of our slow renovations, and during inching forward we learned a lot about how to renovate frugally. The floors in one home were hardwood but in horrible shape and too thin to withstand a deep sanding. I decided to use deck paint and paint them all dark. Unfinished oak cabinets are one of the least expensive options for kitchens. You can paint or stain them in 1000’s of ways with just a bit of research and a few afternoons of labor. A large percentage of the costs of home renovations are in the labor. My husband and I taught ourselves how to do a lot of things through books, You Tube video’s and how to sites. Craftsy also has 2 free mini classes that you can watch and learn cabinetry tips & techniques as well as flawless wood finishing techniques. We over bought tile for one project so we used it in the next. I bought way too much paint for the first home, so we used it up in the next home. I have found bathroom cabinets, tile, hardware and mirrors for next to nothing at yard sales. You can also try Craigslist, or Freecycle if they are active in your area. Currently we are renovating our bathroom. The toilet and shower got done but then we ran out of money. We are making do by washing our hands in the nearby kitchen sink until we have the cash in hand to pay for the sink and its base and counter top. We priced out flooring at a big box store and had panic attacks. Then we remembered a Lumber Liquidators ad we had seen and drove to a neighboring town to check it out. The prices could not be beat. We floored one entire small home for under $1000 and a larger home for under $2000. Another place to look for items needed in renovations for lower prices is Amazon. 8. 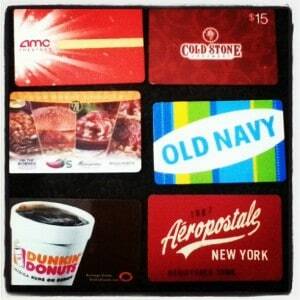 Purchase Discount Gift Cards and if shopping online check to see if you can get cash back. Discount Gift Cards are available for saving of up to 8% for both Lowes and Home Depot. 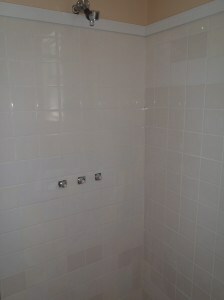 8% may not seem like much but when you doing a whole home renovation 8% can quickly add up to hundreds of dollars saved. One sites we use frequently is Cardpool. If you are buying items for renovations online, you might also want to check for an available cash back from sites like Ebates, or Top Cash Back, and don’t forget point programs that offer cash backs in the form of points that you can cash in for gift cards (often for hardware stores where you are buying materials) such as Swagbucks and Mypoints. Just a few minutes of comparing different cash back sites can save you as much as 8% off your purchase. One home we bought was missing half its stairs and railings. My husband came up with the idea to save the remain spindles, and stairs and mix them in with new. We then hired a carpenter to do the job of blending old and new together. I painted all the stairs black and the railings white so that you could not tell which ones were old and which were new. Even hardware stores have clearance sales. 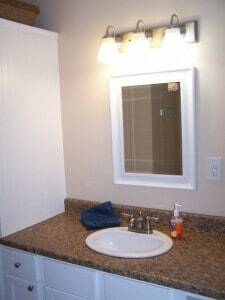 Items we often find are light fixtures and faucets. We have found that hardware stores change their displays twice a year, once in fall and once in spring and those are the best times to look for clearance. How has your family saved money on renovations? Not Sure Where You Would Find The Time To DIY? 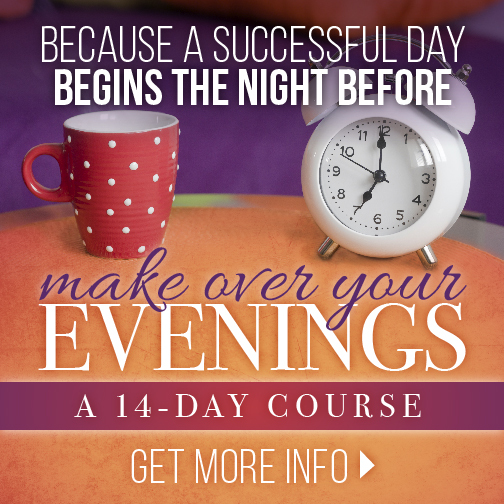 The Make Over Your Evenings Course will help set you up to manage your time in a way that will free up time to tackle that next renovation project–or whatever else you have been wishing you had time for. I recently took this course and although I thought I was managing my time really well I was able to free up 25 minutes each morning by implementing what I learned. Gain time to work on that next project! Grab your copy here. Hi. I am very interested in the deck paint option. All our floors are hardwood. 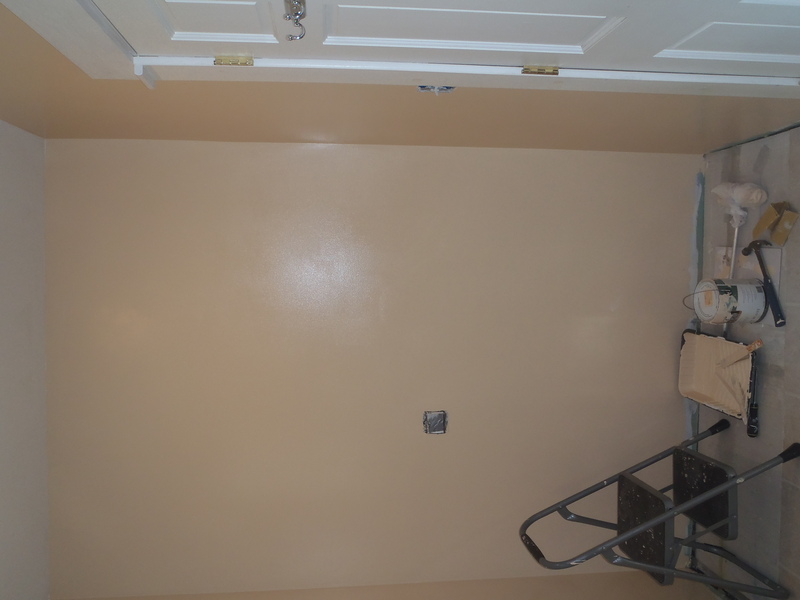 We refinished the downstairs when we moved in with the plan to carpet the upstairs bedrooms and steps. However, 5 years later the carpet money is still not in the budget! How did you use the deck paint and does it cover well? Two rooms have dark spots from vandals who dumped paint out and the hall has dark spots from water damage. Would this work? I really do not want to refinish the bedroom floors. I thinking if you went with a dark color like I did it should work to cover the floors dark spots. What I did was first sand the floor lightly, then I washed the surfaces really well to make sure they were completely dust and dirt free. After they dried over night, I gave all the floors a coat of primer using a roller. I then let that dry over night. The Third day I put on one coat of Lamp Black deck paint from home depot (again using a roller, a long handle one is excellent since it means you can paint it standing up). I did cut the corners in with a paint brush. Once the black coat was dry I then covered the whole floor with 2 coats of polyurethane which I applied with a foam roller, so as to minimize the bubbles. I learned how to do it from reading a few e-how articles so you might want to read up on it there too. This is such a great post! We are looking into doing some renovating of our downstairs bathroom and possibly kitchen flooring and are on a budget. 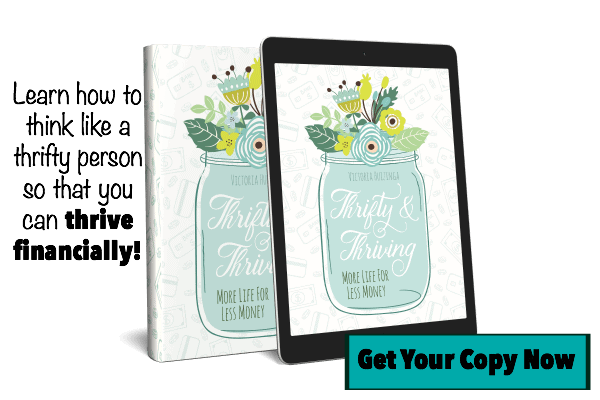 We are really not do it yourself people but with all the books and videos out there, we might be able to learn how to do it 🙂 Thanks for linking up at Thrifty Thursday! 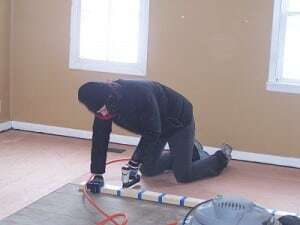 There are so many flooring options out there and a lot of them are DIY friendly, I hope you find a good mix of inexpensive and DIY friendly for your renovation. Another great tip is to have friends who are DIY fanatics to come over and help you with your project, so they can share their wisdom. 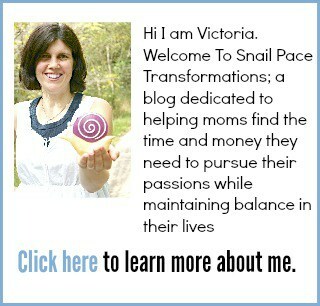 I love to find people that are creative and frugal at the same time! I like what you did with the wood floors. I’m passing this on to a friend who is in the same dilemma. 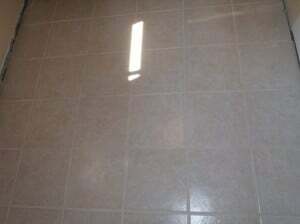 Here is an article on how to do a garage floor for less than $50. Definitely shop the deals. I’ll check the clearance area my Lowe’s has in the corner every time I go. I’ll even ask the flooring guys, who I have a rapport with, if they have any discounted, or open boxes. Every now and they I’ll find a steal. 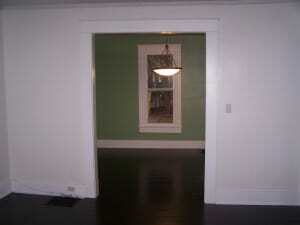 We rent one home out, we live in another and we sold the original home that we lived in. Let me guess the linoleum is bright green or yellow with a busy pattern? If you replace it with linoleum my husband found the best way is to buy brown paint splatter paper (comes in a huge roll in the paint section at Walmart) and cut it to fit the floor first, and then use that as a pattern to cut your linoleum. Have fun renovating! If you have a Habitat Resale store in your area you can get lots of renovation supplies there. Great tip! We don’t have one near us but I have watched a few renovating for less shows where they have used items from Habitat Resale and they have gotten amazing stuff. Yes, we have so much fun stopping in the habitat for humanity stores! So many different renovation products. As you are remodeling, you might check to see if there is a Habitat for Humanity “Re-Store” in your vicinity — they have tons of mildly used sinks, tubs, cabinets, tools, some furniture, barbeques, TONS of stuff for quite cheap — you have to check it over, of course, but the finds can be awesome!! And you are are helping others get a home too. We finally did get a small Habitat for Humanity “Re-Store” in our town. It is only open one day a week for 3 hours but I am looking forward to looking around and seeing what they have next time we remodel. I wanted to confirm that you used black deck paint on the stairs. 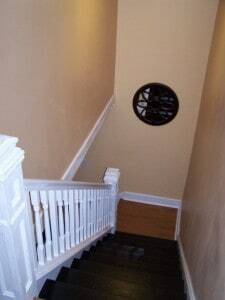 I have replaced the wood on my stairway and I am trying to decide how to finish the stairs. I look forward to hearing from you! Yes black deck paint, I use the Behr brand from Home Depot. I used a grey primer underneath, then two coats of deck paint (allowed each to dry 24 hours) then 2 coats of ployurethane (again allowing 24 hrs to dry inbetween). Do not skip the polyurethane step, I did on my kitchen cabinets and now I am going to have to paint them all over again due to pait wearing off but my stairs are still great and they were painted at the same time as the cabinets. One last tip humidity and temperature make a HUGE difference to how your paint will set, you don’t want it too cold or too humid otherwise you get a sticky finish. HI there! I love this post because it’s so practical! I love the ideas you put forth to renovate your home when you don’t have bunches of money!!! I really want my readers to know about this too! I want to share this in my weekly series called “Roll Out The Red Carpet Thursday” – I share bloggers’ amazing posts that I’ve found during the week. I hope that’ ok! Have a great night! That is more than fine! I am honored and I hope these tips help you with your renovations. Thank you for these wonderful tips. I would suggest exploring your town for other resources too. 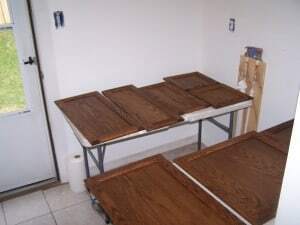 We don’t have a Habit for Humanity Store BUT we do have a local Use and Reuse store where there are cabinets, doors of all kinds from outside doors to inside doors to screen doors and storm doors as well as all kinds of windows. And a lot of other things like faucets. Also check out others who are renovating and often simply throw away their things to the curb for trash pick up. With a little work, this “trash” can be your treasure. And don’t forget resale shops. Our local one has had several sink consoles at a bargain price! I have also found that sometimes the more you buy, the bigger discount you get so get together with others to buy in bulk. I also search out the Ooops section in the paint departments where customers changed their mind once the paint was mixed. 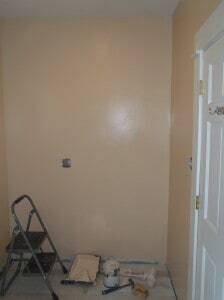 I once found Behr paint for $10 a gallon in a few shades lighter than I originally wanted and it worked beautifully. And it was the kind with the primer included! Also, think about renting any big equipment you might need if you are not going to be using it much. That can save you dollars. Or better yet, see if you can borrow it from a friend. And don’t forget bartering! Someone else might have a skill to do what you can’t while you can do something they can’t. Share your knowledge with each other and you have a win win situation! 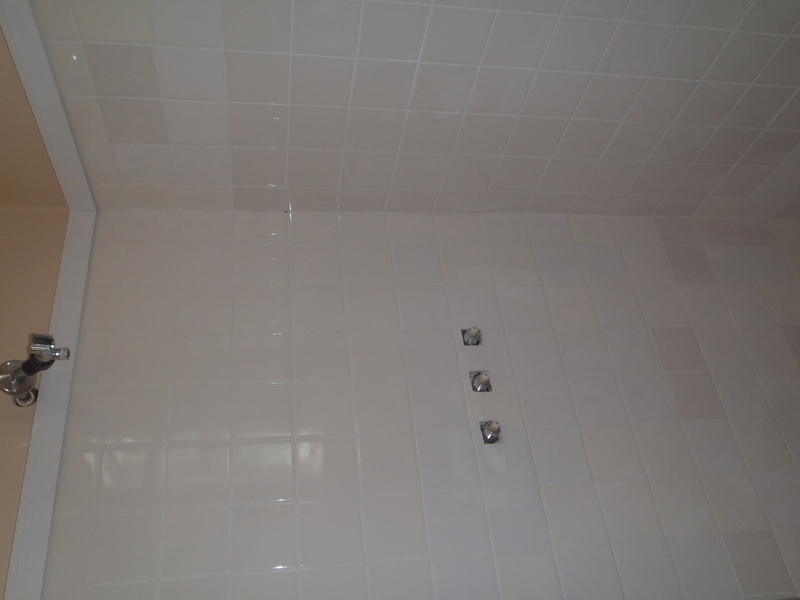 The work I have had done recently was custom fitting and installation of bathroom fixtures, plus new skylight and roof tear-out and installation. Neither of those are DIY for 2 people overr 55. Its true a good portion of home renovation can be taken on and done to the minimum code with a little research and some calls to the local building department. My wife and I have been renovating our home for the last seven years and during this time we cut costs by learning and doing the majority of the work ourselves, this has equated to saving thousands of dollars. 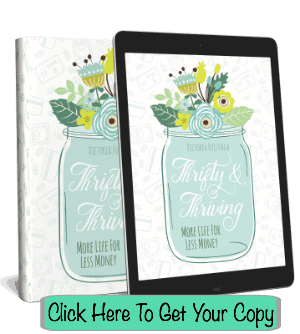 If your truly serious about saving money you can and will find the deals. Some great ideas here. I just went through an ‘unwelcome renovation’ (see: dishwasher leak) and definitely used some of these tips to save cash.